GENEVA, Switzerland - March 23, 2018 - PRLog -- In a world driven by information, communication and technology, a big challenge remains to be risen to how to leverage all the knowledge we've built to attain the Sustainable Development Goals. The discussion was initiated by the United Nations, through its agencies ITU, UNESCO, UNDP and UNCTAD during the World Summit on the Information Society (WSIS), held in Geneva from 19-23 March. As a committed supporter of the SDGs and the role of ICTs in promoting development and equality for all, Horyou, the social network for social good, was invited to share its experience in two panels alongside entrepreneurs, ICT industry members and government officials, as well as with high-level members of international organizations, the private and public sectors and civil society. On the first day, Yonathan Parienti, a former banker who four years ago decided to leave the financial industry to become a social entrepreneur himself, spoke about the ICT skills required from social entrepreneurs. «It's great to see how the youth is engaged in social entrepreneurship, aiming to make a difference and do good. At Horyou, we believe in technology with a purpose, so some of the skills required to follow this path are courage and optimism», he stated. His experience, both as a finance professional who developed Spotlight, the global social currency for economic inclusion, and as a social good media founder, was shared on the 20th of March during the High-Level Policy Session on Financing for Development and the Role of ICT. Since Horyou launched Spotlight last year as a funding alternative for impact-driven projects and organizations with the purpose to induce a fair capital distribution globally, Parienti defended the need to use innovations such as Blockchain to promote equality and inclusion. Alongside WSIS executives, government and officials including Thomas Schneider, Ambassador and Director of the Swiss Federal Office of Communications, Ernesto Rodríguez, IT Director of Communications Ministry of Cuba, Dr Salma Abassi, CEO eWorldWide Group, Pavan Duggal, Founder and Chairman of the International Commission on Cyber Security Law. Advocating the use of Technology with a Purpose, Horyou was able to garner interest from some government officials to explore potential collaborations that may benefit civil society and the youth via a social networking platform that promotes social good and supports the implementation of the UN Sustainable Development Goals. 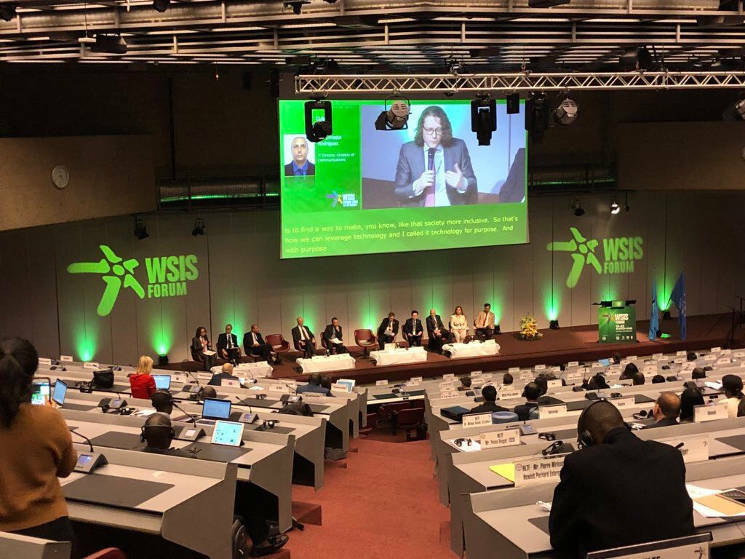 "The international ecosystem brought within WSIS is an ideal platform for bilateral exchanges and discussions on leveraging technology and innovations to build the solutions for a more sustainable tomorrow", said Parienti. Ending on March 23rd, the WSIS organized side activities including a hackathon, the WSIS award, and provided room for innovations such as virtual reality and a TEDx Geneva.